Airline rankings have just got an upgrade. As have airport rankings, but more on that in a moment. Oftentimes, ticket price is the number one reason for making a purchase, but so much more goes into your overall air travel experience. So it’s time you got the whole picture. We feel that airlines should strive to provide a superior level of service, both in the air and on the ground. Airlines should also be consistently punctual, because your time is precious. Perhaps most importantly, they should treat you well when things go wrong. So it might be helpful to stack the odds of a smooth journey in your favor. AirHelp Score is our data-driven way of making that possible, combining expert knowledge and industry expertise to give you all the information you need to make that booking in confidence. 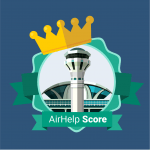 And for the first time this year, we’ve also added airports to AirHelp score, so now you truly have everything you need. It’s all laid out in the infographic below, so please share it with any friends and family who are regular air travelers. They’ll thank you! AirHelp collects data from multiple commercial vendors in order to create the most reliable and accurate collection of flight data in the world. The database then cross references these figures with a variety of reliable sources such as government agencies, airport databanks, flight-tracking vendors, historical resources and so on. When different sources disagree, AirHelp ranks them in order of authority, but the data is not manipulated to estimate the ‘actual’ arrival and departure times. Minimal delays of less than 15 minutes are interpreted as being on-time. To measure airline on-time performance, AirHelp calculates how many flights in the whole examined period arrived on time. We express it in percentages (for example score 8.5 means 85% of flights arrived on time), with a higher percentage meaning more flights are on time. AirHelp uses Skytrax Airline Star Rating, which is a professional quality benchmarking system classifying airlines based on the quality of product and customer service experience provided to travellers. Skytrax is a UK-based company which conducts research for airlines worldwide, with ratings out of five across the following categories: airport service, airline lounge, aircraft seats, inflight meals, entertainment, cabin staff, and comfort, as well as a number of further subcategories. Customer processing efficiency consists of the following three categories: how responsive an airline is, how good its internal claim handling procedures are and how quickly it pays out for valid claims. We have used only AirHelp claim data and not claims that airlines may have received from other channels. Claim handling: takes into consideration the number of times an airline wrongfully rejected or ignored a claim, in relation to the total number of claims submitted in a given season. Claim turnaround: calculates the total time the airline takes to acknowledge and process a valid claim. Claim payout: takes into consideration how long it takes for an airline to pay out the money owed on a valid claim. AirHelp collects data from multiple commercial vendors in order to create the most reliable and accurate collection of flight data in the world. This database then cross references these figures with a variety of reliable sources such as government agencies, airport databanks, flight-tracking vendors, historical resources, etc. To measure airport on-time performance, we first calculate daily on-time percentages of non-disrupted flights out of all flights departing that day from an airport. Given the daily punctuality rates, a median is computed for the whole analysis period. We then use the median rather than the average, because it is more resilient against outliers. As a result, the score is forgiving towards airports that suffer an occasional performance dip due to severe weather or other extraordinary situations, since it takes into account their typical performance. AirHelp uses Skytrax Airport Star Rating, which is a professional quality benchmarking system classifying airports based on the quality of product and customer experience provided to travellers. Skytrax surveys the experience of international travelers at a given airport, providing scores out of five under the following criteria: process efficiency, terminal comfort and cleanliness, passenger facilities and staff service (both official airport staff and customer service staff). We analyzed Twitter to gain deeper a understanding of how passengers feel about airports. In total, 136,644 English-language tweets were collected. Using machine learning and natural language processing techniques, we have developed a statistical model that estimates the odds of a tweet being positive. If the odds are high (80% and higher), we interpret the tweet as positive. If the odds of a tweet being positive are low (39% and lower), we assume the sentiment is negative. The middle values (40-60%) can be interpreted as neutral. In addition, tweets have been ranked according to their relevance to ensure that tweets carrying no significant sentiment (such as airport weather reports, news feeds and car rental ads) are excluded from the analysis. Finally, we have calculated the average sentiment scores per airport and rescaled them on a scale from 1 to 10 (from highly negative to highly positive). A look back: Why did we create the AirHelp Score? AirHelp had (and still has) one of the largest collections of flight data on record. We’d analyzed millions and millions of data points in order to rank the airlines in a revolutionary new way. After hundreds of thousands of interactions with the airlines and their disgruntled passengers, we truly understood all of the personal pain points that people face when trying to file for compensation with the airlines, and we wanted to help spread the word about who was doing it right and who was doing it wrong in the ever-evolving landscape of the aviation industry. On top of that, we also knew better than anyone else the tactics that airlines can use to try and wiggle their way out of paying you compensation. So when it comes down to it, the AirHelp Score really was just another way for us to put powerful, informative data in the palm of your hands, and help better inform you when it comes to making a ticket purchase and investing in your travel and vacation plans. It was also our hope that the AirHelp Score would become a conduit for more open communication between the airlines and their passengers, so that we can all come together and address flight delays in a more timely and professional manner. We wanted to put the power of big data directly into the consumer’s hands, which thus began the birth of our first-of-its-kind, global airline-ranking system. In a nutshell, we wanted you to be able to better predict how the airlines will treat you when they end up missing the mark and your flight gets delayed, canceled or overbooked. How can I use the AirHelp Score to help me plan my next trip? If you not only want to have a pleasant in-flight experience, and you also want to make your trip as hassle and stress-free as possible, then try to book with an airline that has the highest AirHelp Score! By booking a flight with an AirHelp Score top performer, you are not only more likely to have a more enjoyable flight experience, but you also have a much better chance of ensuring that the airline will actually give you the help you need if something goes wrong and a flight disruption occurs. By publishing this never-before-seen data, we hope you’ll be able to better anticipate if an airline will handle your claim for compensation in a professional and timely manner, in the event that a delay, cancellation or overbooking occurs. So if you are the type of traveler who likes to get the best deal, you can use our rankings as a guide to help you decide which airline to book with. For instance, you can use it to determine whether you should spend a few extra dollars to book with a higher-ranking airline, versus going with a slightly cheaper option, where you may end up finding yourself stranded at the airport delayed for hours and hours with no hope in sight! When it comes down to it, we want to make it as easy as possible for you to make a more informed purchasing decision and help you in any way we can, so that you can get the help that you actually need!